"Spreading strife is my greatest joy." Joseph Campbell was born on March 26, 1904, near New York City. So far as is known, no great prodigies or miracles accompanied his birth, but it was the start of a life that was to influence many people who read his books, listened to his lectures, saw him on TV, or read about his ideas. Campbell was born and raised in New York City in an upper middle class family. As a child, Campbell became fascinated with Native American culture when his father took him to see Buffalo Bill’s Wild West Show. In Campbell’s own words, he “became fascinated, seized, obsessed, by the figure of a naked American Indian with his ear to the ground, a bow and arrow in his hand, and a look of special knowledge in his eyes.” He soon became versed in numerous aspects of Native American society, primarily in its mythology, and made numerous visits to the American Museum of Natural History. This led to Campbell's lifelong passion with myth and its similar, seemingly cohesive threads among all human cultures. A best-seller in 1949, and again in the 1960s when the psychedelic crowd discovered it because it was a road map to the inward journey. Then a best-seller again when The Power of Myth series was aired. At Dartmouth College he studied biology and mathematics, but later transferred to Columbia University, where he specialized in medieval literature and received a Bachelor of Arts degree in 1925 and a Master of Arts degree in 1927 for his works in Arhturian Studies. He was awarded a Proudfit Traveling Fellowship and went on to study Old French and Sanskrit at the University of Paris and the University of Munich. During this period in Europe he was exposed to the modernist masters (Picasso, Joyce, Jung and others) who would influence his work, and which led him to theorize that all myths are the creative products of the human psyche, that artists are a culture’s mythmakers, and that mythologies are creative manifestations of humankind’s universal need to explain psychological, social, cosmological, and spiritual realities. After a period of reconnecting with family and reading during the Depression, Campbell decided not to go forward with his plans to earn a doctorate or teach at Columbia; like many young men of the period, he chose to hit the road and experience America, and to hopefully find what he wanted to do with his life. He lived in California for a time, including a stint in Pacific Grove in the company of Carol, Steinbeck and marine biologist Ed Ricketts, at which time he worked to develop his writing. He spent an unhappy year back on the East Coast as a housemaster at the Canterbury school, followed by a year in a cottage without running water in upstate New York in 1933, where he focused on reading and writing. In 1934 he accepted a position teaching literature at Sarah Lawrence College, which he held for 38 years. It was at Sarah Lawrence that he met and married one of his students, Jean Erdman, who would go on to become a prominent figure in modern dance. Campbell is considered by some to be one of the most famous autodidacts, or self-educators, and is sometimes seen as a poster child for this way of learning. He learned to speak at least French, German and Sanskrit in addition to English. According to poet and author Robert Bly, a friend of Campbell, Campbell developed a systematic program of reading nine hours a day. According to Campbell, this is, in a sense, where his real education took place, and the time when he began to develop his unique view on the nature of life. Campbell’s literary career began in earnest with the editing of the posthumous papers of indologist Heinrich Zimmer, whom Campbell befriended a couple years prior to Zimmer’s passing. With Henry Morton Robinson he wrote A Skeleton Key to Finnegan's Wake, for which generations of puzzled readers of James Joyce have been grateful. His first solo, full-length endeavor, The Hero With a Thousand Faces, was published in 1949 and went on to become a classic. In it, Campbell posits a Monomyth (a term borrowed from Joyce), a pattern that it common to the myths of every culture, and argues that the hero’s journey is metaphor for both the individual and for culture. He went on to write and edit numerous other works, in addition to being highly sought as a public speaker. In 1956, he was invited to speak at the State Department’s Foreign Service Institute, and delivered two straight days of lectures without any notes. His talks were so well-received, he was invited back annually for the next seventeen years. In the mid-1950s, he also undertook a series of public lectures at the Cooper Union in New York City; these talks drew an ever-larger, increasingly diverse audience, and soon became a regular event. Campbell retired from Sarah Lawrence in 1972 in order to devote himself to writing, but continued to engage in two-month long lecture tours every year. He died in Honolulu in 1987 after a brief battle with cancer. In 1988, millions were introduces to Campbell through Joseph Campbell and the Power of Myth with Bill Moyers,, which was comprised of conversations that two had videotaped over the previous several years. When you follow your bliss, signs will appear and doors will open for you. "People always asked him, did he pray or did he meditate, and he would reply 'I underline sentences.' The Way of the Scholar. He read 10 hours a day, almost everyday for 70 years. If you go to the archives in Santa Barbara California and open a book, there are those underlined sentences. Book after book with little margin notes in tight writing. Open Nietzsche and passages are underlined with little notes in German. This was a scholar to the last moment of his life. "Hearing any similarites to Brian Eno? 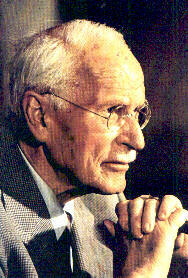 He talked about Jung incessantly. Nietzsche quite a bit. and Schopenhauer too. "Thus a word or an image is symbolic when it implies something more than its obvious and immediate meaning." 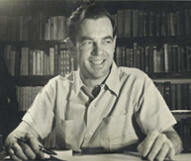 Joseph Campbell Foundation - Biography, bibliography, links, excerpts, details of foundation's activites. The Joseph Campbell & Marija Gimbutas Library, located on the campus, are part of the Center for Study of Depth Psycholgy, also dedicated to the works of James Hillman. Comparativism in a World of Difference: The Legacy of Joseph Campbell to the Postmodern History of Religions A 1994 lecture by David Miller. Also see The Fire is in the Mind, revised in 2004. BeBrooding a Few Ideas: Joseph Campbell's Journaling into Destiny, (PDF file, 112K) by Dennis Slattery, 2004. The bibliography (PDF file, 117K) of works cited in The Hero with a Thousand Faces, compiled by Richard Buchen. An interesting look at the many books he read in order to produce this important work. "Chaos, the word, appears for the first time in Hesiod's Theogony, one of the roots of Greek mythology and religion. It was th source text for Orphism, which was the the most important religion of ancient Greece. Chaos was not just another word in Hesiod's Theogony, but one of three basic principles, three abstract principles - Chaos, Gaia, and Eros - out of which everything else was created, step by step, in the creation myth of Greek mythology." Pre-Columbian Middle America's contribution to the global culture. cultural wars of the 21st century? Recapturing the Lost Soul of the New World as we countdown to 2012. The Joseph Campbell & Marija Gimbutas Library is a non-profit educational organization dedicated to the preservation of a unique collection of books, manuscripts, and memorabilia from esteemed cultural scholars of this century: mythologist Joseph Campbell, archaeologist Marija Gimbutas, psychologist James Hillman, and others. The Library is located just south of Santa Barbara, California, on the secluded campus of Pacifica Graduate Institute.